Juicing and cleansing are more popular than ever, but most programs ask readers to avoid food and live on juice alone for days on end. 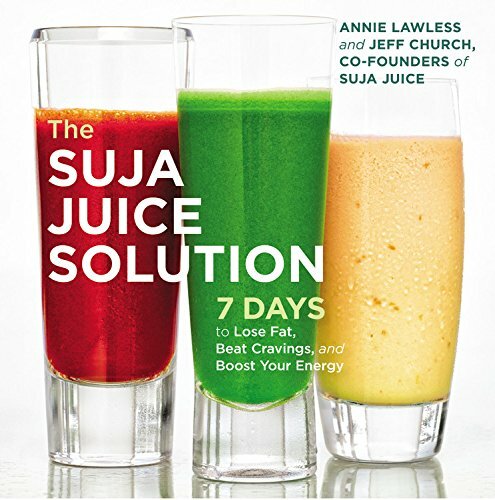 Enter THE SUJA JUICE SOLUTION, a groundbreaking new detox from Annie Lawless and Jeff Church of Suja. This easy-to-follow 28-day program features a powerful 7-day jumpstart of high-energy green juices and antioxidant-rich mini-meals designed for readers to detoxify and lose weight without deprivation. Over the 4-week program, readers gradually increase their intake of whole, fresh foods, while learning to crowd out unhealthy foods with nourishing juices and more balanced, healthy options. In just four weeks, readers will beat sugar cravings, decrease inflammation, boost energy, improve skin and drop pounds. With over 75 recipes and mix-and-match meal plans, THE SUJA JUICE SOLUTION is an all-in-one resource that sets readers off on a life-long path towards improved health and sustainable wellness. About: Now a New York Times bestseller1 Week, 2 Steps, 3 Juices Juicing and cleansing are more popular than ever, but most programs ask readers to avoid food and live on juice alone for days on end. About: The New York Times bestseller makes detoxing easy!